THE History of the tvvo Maids of More-clacke, VVith the life and simple maner of IOHN in the Hospitall. ROBERT ARMIN, seruant to the Kings most excellent Maiestie. Played by the Children of the Kings Maiesties Reuels. LONDON, Printed by N. O. for Thomas Archer, and is to be sold at his shop in Popes-head Pallace, 1609. 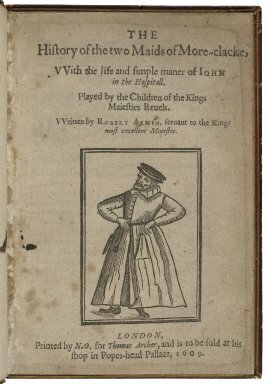 Title page imaged from Folger call number: STC 773 copy 1. Image is not from the transcribed copy.